What do you do to be able to get the news from the Apple get togethers? Their big announcement events or keynotes? We generally watch several different web sites that have reporters in the audience. The pages get a few pics and auto refresh with text as the person enters it. This mean, our eyes are glued to the computer screen and yelling out highlights like “8 MP!”, bits of info that we want to make sure everyone else saw too. Some of the team jump from one Web site to another in case one reporter types faster than another. For them, no work is getting done. 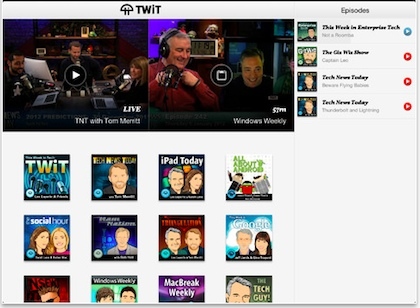 A solution we will be trying for this week’s Apple event is the Twit.TV app. A Free Universal app that we use daily to watch shows on many different technologies. The group of reporters/interviewer are ex-TechTV hosts. You might know them from shows like Screen Savers and Call For Help. 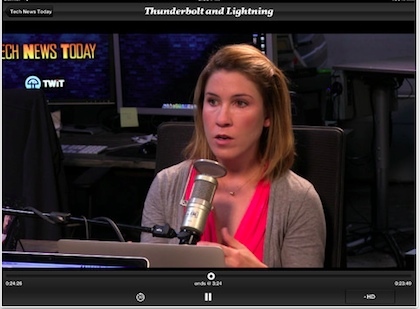 Shows are available live from their studio in California, streamed to your iPhone or iPad. It is fun to see the live stream between the scheduled shows too as the teams set up for the next show. Don’t worry if you have a meeting to attend when a show is live, recorded versions are also available to watch when your time permits. For the Apple event, many of us will be keeping an eye on the Twit.TV app to watch the coverage of the (iPad Mini/Nano? 13″ Notebook?) Apple event. No need to read text as it appears on a refreshing Web page. Since the app offers Audio and Video/Audio, our team members not able to watch on their iPads will be listening to the event coverage with their iPhone headphones as they go about their normal day.